It certainly cannot be called mighty or majestic, and there are few points along its 63.4 km course which could in any way be called scenic. 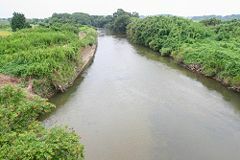 Still, The Sakuragawa (Sakura River), which flows through Tsukuba City after it winds its way down just west of Mt. Tsukuba on its way to lake Kasumigaura, gushes with historical and cultural significance, much of which is reflected in the river`s name- which can be translated directly as The Cherry Tree River, and by association as The Cherry Blossom River. Now for anyone who has actually seen The Sakuragawa`s Tsukuba segment, this moniker might seem strangely inappropriate, as there are NO SAKURA TREES along its banks in these parts. 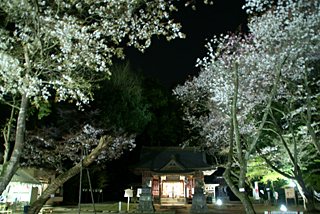 In fact, even the now famous cherry blossom spots along The Tsuchiura City portion of the river, the last few kilometers before it runs into the lake, were first created in the early 20th century with the planting of hundreds of sakura of the SOMEI YOSHINO variety, a hybrid which is now the most commonly seen cherry tree in Japan (some say 80% of Japan`s sakura are this variety). For this reason, residents of or visitors to Tsuchiura and Tsukuba haved asked- Why is it called the SAKURA-gawa even if there are no sakura (cherry trees)? What IS the connection between this river and cherry trees? Well, to answer that question we have to head to the source – the source of the river itself- up north of Mt. Tsukuba to a town called Iwase, which has recently merged with other towns to become what is now know as Sakuragawa-City. It is there that we can find the kagami ga Ike (鏡ヶ池), a now undistinguished pond, out of which The Sakura flows. It is in this vicinity, however, around the venerable Isobe-Inamura Jinja Shrine, that since ancient times many fabulous wild sakura trees have bloomed. These YAMAZAKURA, the wild cherries which bloom white blossoms AFTER bearing leaves (in contrast to todays SOMEI YOSHINO variety which blossom pink BEFORE sprouting leaves), were so renowned during the Heian period, that there was actually a saying: NISHI NO YOSHINO- HIGASHI NO SAKURAGAWA! (As for Sakura) In the West there is Yoshino and in the East there is the Sakura River( Yes, OUR Sakura River!). You might be even more surprised to learn that Zeami, the theatrical genius who brought the sublime art of Noh drama to its greatest heights, wrote a play entitled SAKURAGAWA which is set at the Isobe Inamura Shrine and uses the above mentioned poem and its imagery of a river of floating petals as a key motif (for a synopsis see www.jstor.org/pss/2384884 ). In 1924, the area around the shrine was declared an official famous cherry spot and in 1974 , eleven of the varieties of wild cherry found there were declared National Monuments. Since these wild species bloom later than the ubiquitous SOMEI YOSHINO, you still have a chance to enjoy a more AUTHENTIC hanami in Iwase, Sakuragawa-City. These were the types of trees traditionally celebrated with HANAMI and poetry etc. To tell the truth, there is still alot more to tell about the Sakura River, but I will leave that for further articles. Anyway, I am sure that after reading this, there will be no more scoffing the next time you cross The Sakura River. It IS majestic in a way. Oh, just one more thing about the Isobe-Inamura Shrine, which is about a 45 minute drive north from central Tsukuba. Within its precincts lies a stone which is said to be the TAIL OF THE CATFISH whose head protrudes from the ground at the Kashima Grand Shrine ( Ibaraki`s most important shrine). This catfish is believed to cause earthquakes if it thrashes around, and thus by pacifying it, seismic disasters are prevented. These stones are known as KANAME ISHI. Ancient Rituals For Silkworms at Kokage-San Jinja- hanging on to life by a fine silk thread- on March 28th and October 23rd! 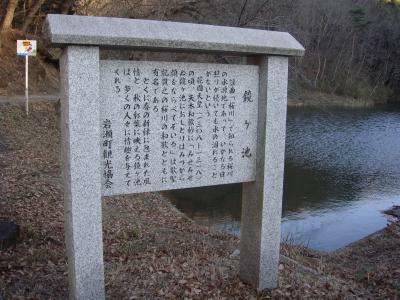 Here is the local legend that explains the origin of the name KAGAMI GA IGE (Mirror Pond), which is the source of the Sakura River. On his way to subdue the rebels up in Oshu (the North-East), the warrior “Hachimantaro” Yoshiie stayed for the night at the home of a local magnate in a place called O-sato, now Kanasago Village in Kuji County. Looking around and seeing the splendor that his host lived in, Yoshiie said to himself, “If I don`t take care of this fellow now, he`ll make trouble for us in the future.” So he ordered his men to destroy the manor, and eliminate the magnate and his family. There was one daughter,however, who was survived. She was smuggled to safety by her old nurse-maid. and taken to a house near the Kasuga Shrine in what is now Iwase, Sakuragawa City, where she prayed daily for the repose of her dead parents` souls. The one thing she had with her to remind her of the luxury she had once lived in was an small octagonal mirror. One day she hung it from a pine tree near a pond so that she could make herself up. But the mirror slipped and fell into the pond! She tried to retrieve it but she slipped, as well, falling into the pond. It was deep and she couldn`t swim – so she drowned. After that, her spirit continued to haunt the area, causing greaat consternation among the local villagers. Not knowing what to do, they went to the priest of the Jo-fukuji Temple, a saintly man known as Ryo-yo Sho-nin. He was able to console her spirit and bring peace and stability back to the area. One day after that, a turtle crawled out of the pond – and it had the girls octagonal mirror on top of its shell! The people were amazed and took the mirror to the temple. After that, whenever the villagers found a turtle somewhere they would take it to that pond and release it, believing that it brought consolation to the spirit of the dead girl. Her ghost never caused any trouble ever again – and the pond came to be known as KAGAMI GA IKE – Mirror Pond.